string(1190) "Resource Centre > Uncategorized > Health Care Code for Ethical International Recruitment and Employment Practices"
The Health Care Code for Ethical International Recruitment and Employment Practices (Code) reflects the mutual recognition of stakeholder interests relevant to the recruitment of foreign-educated health professionals (FEHPs) to the United States. It is based on an acknowledgement of the rights of individuals to migrate, as well as an understanding that the legitimate interests and responsibilities of health professionals, source countries, and employers in the destination country may conflict. It affirms that a careful balancing of those individual and collective interests offers the best course for maximizing the benefits and reducing the potential harm to all parties. 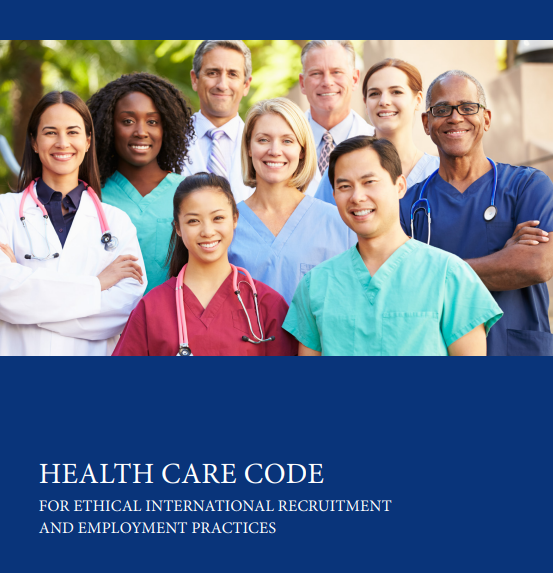 While the Code acknowledges the interests of these three primary stakeholder groups, its target audiences are the organizations that recruit and employ foreign-educated health professionals (e.g., third party recruiting firms, staffing agencies, hospitals, longterm care organizations, health systems). For the purposes of the Code, “Recruiters,” refers to those who contract with FEHPs in a source country in order to facilitate their migration to the United States and their placement in health care employment. “Employers” refers to those health care organizations that employ FEHPs in the United States. Some entities provide both services (i.e., a health care employer may engage in direct recruitment and a recruiter may employ FEHPs under a staffing agency model in which the agency employs and contracts health professionals to healthcare organizations on a short or long-term basis). Where recruitment and employment services are the shared responsibility of two or more entities, each is responsible for ensuring ethical conduct throughout the process. Recruiters and employers certified by the Alliance voluntarily agree to comply with ten guiding principles and the specific standards agreed upon by stakeholders to advance these principles. Certification also implies full cooperation with the monitoring system developed by a representative Board of Governors. In addition, they must comply with the laws of any foreign country in which they operate, whether through a permanent office, an agent relationship, or on an occasional basis, and comply with the laws of the United States, including relevant employment and immigration laws.